A double release event will take place at the Brink Lounge on Friday, September 28 at 7 pm. Dana Perry will also release her new album, Reclamation (read a review here). Oftentimes, music is the summation of experiences gathered through peers, acquaintances and places. Jeffrey James has been many places and met many important people who are now making a difference in his life and music. None of this is without struggle and risk, of course, and James reflects on his recent years on his new full-length recording Everywhere. An important impetus for James was his abandonment of drink and drugs nearly five years ago. It was 2013 when James tried relocating to Hawaii. This after he enrolled in music school in Portland, Oregon, subsequently dropping out. After Hawaii he landed in Breckenridge where he had a promising career as a snowboard instructor. An injury, coupled with a strong musical calling saw him give all that up and he’s not looked back since. Nearly everyone involved with his latest recording are products of those years of struggle, misdirection, soul-searching, touring and re-direction. A strong collaborative effort with Russick Smith is behind Everywhere. Smith, who runs a Breckenridge Weekly Songwriter Circle is a multi-instrumentalist who contributed cello, a variety of basses, mandolin and drums. He also produced and engineered much of the album in Breckenridge. The Hawaiian and Portland connections are huge for James. Tim Snider is a classically trained violinist who also plays guitar and incorporates flamenco, jazz and Cuban influences. He and James probably met in Portland but Snider is also a member of Nahko and Medicine for the People, a Hawaiian musical collective that brings a powerful spiritual sensibility to their music and connection to their audience, employing hip-hop & folk rock in combination with a world message in service to the planet. Max Ribner, who plays trumpet and flugelhorn, is also a member of the Nahko collective. All of these folks are integrated into the making of Everywhere and each have separate musical projects of their own. In 2016 James recorded his Give Back EP with Snider and together they produced an official music video for fan-favorite song, “Home Again.” The EP was recorded with Sam Minaie a bassist and engineer who owns Birdfood Studios in New York City with a long list of credits that includes work with Tim Snider. Minaie mixed and mastered Everywhere. In 2017 James toured Europe, an excursion that provided the bulk of the inspiration for Everywhere. “I lay it all out there,” James says. “I expose the darkness and dishonesty I’ve struggled with on the road and also share the joy, laughter, and beauty that I’ve encountered across the world.” James spent the rest of the year shooting a video in Hawaii and writing material for the album. James funded the album through hard work but also Kickstarter, where he was able to procure an astounding 687 pre-orders as of August 10th. By offering a deep discount for early orders he has expanded and solidified his fan base, a great hedge on future earnings from recordings and shows. Everywhere is comprised of eight succinct songs, clocking in at only twenty-eight minutes. The overall mood is breezy, possessing an island quality and is largely melancholy given its reflective nature. Though there is ample instrumentation, it’s easy to hear the core of these songs played stripped down, with one or two instruments and even with no percussion. This is key as the music can be reproduced live in a number of settings without any loss of impact. “Two Bucks” introduces layered flugelhorns and tastefully played drums with washy cymbals, roto toms keeping the island flavor and backup vocals from fellow Jeffrey James Show member Maggie Poff. James’ vocal delivery makes this sound like a Dave Matthews tune without all the bombast. “Ocean Breeze” is a tripped-out island version of James’ recognizable Jack Johnson vibe. This album helps to morph from that style into one that is more worldly musical, because James has been nothing but worldly, exemplifying the planetary citizen through his lyrics and vibe. The multi-tracked guitar lines are impressive and there’s some snappy bass riffing from Smith as well. “Cobblestone Streets” leans toward pop and relies on a repeating chord sequence, strings and horns. It’s weaker song, a little too nice and sounding a bit like mariachi-band, instrumentally. The title track returns to form, a dreamy acoustic guitar accompanied by plucked violin, eventually opening up into a full string arrangement. This is a nice, Colorado/Hawaii-inspired love song with the understated vocal imploring us not to be afraid to love. It builds with that refrain before coming back down for another round. This is a beautiful song, finely arranged. “Bluebird” is another ballad obviously reflecting on abstinence and the difficulty in reaching a goal while losing friends and becoming absorbed in struggle. Here the piano and Poff’s vocal harmonizing are key. 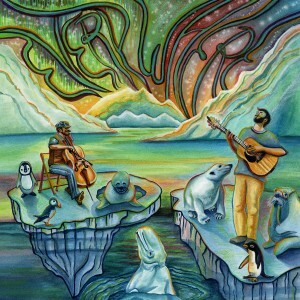 “Whale Song” brings the bounce back; another song that conjures up an island beach. The album ends with “San Francisco in September,” a cool, living-room-session recording that features more resonating slide guitar, violin and cello. It’s deep, rootsy and nicely done. There’s a feeling of magic happening in the room and the mix pulls the listener right into an easy chair. “Success isn’t a formula, it’s a state of mind,” James says. “The drive to succeed won’t always be there, but the undying, unexplainable call to bring joyous music to the masses will always be there for me.” James has obviously come out on the other side and is in a position to take his music to a new level. Everywhere is a mellow record; a bit nice and perhaps even a bit too safe, but he’s purged himself of some demons and found a path that he’s trodding confidently. The road is open now and he has a strong supporting cast that’s likely to expand. He can freely substitute musical risks for some of his past experiences and that makes for a rich recipe steeping in the ether.